Everett Singh is just your normal Punjabi-English geek who loves maths and cooking - oh, and his dad's a genius who's been exiled to a parallel world. No matter how dangerous the mission, Everett and Sen, daughter of an airship captain are determined to bring his dad home. When Everett Singh's dad was randomly sent to one of the many parallel worlds in the multiverse, Everett discovered a way to find him - on the quarantined planet E1, home of the terrifying Nahn. Now he and the crew of the airship Everness have followed the trail to the next world - and his father. But this is a world where dinosaurs have had sixty-five million years to evolve, where death is the key to the throne and where the Empress of the Sun has a plan to wipe out every other creature on her planet. . . and then take her conquest to Earth. And all she needs is the key to travelling through the parallel universes: Everett's infundibulum . 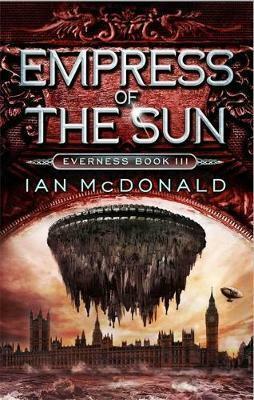 . .
Ian McDonald is one of Britain's most awarded and critically acclaimed SF writers for adults and young people. He has won almost every major award in the SF field, including the Hugo, Theodore Sturgeon, John W. Campbell and British SF Awards and the Kurd-Lasswitz-Preis. He lives in Belfast.